Chocolate Almond Butter or Homemade Nutella - Chocolate Chocolate and More! 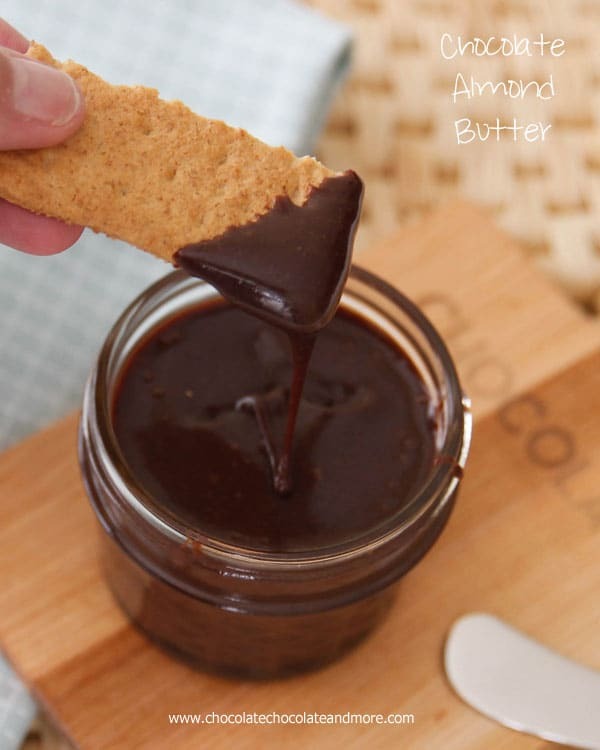 Chocolate Almond Butter-even if you’re not a fan of Nutella, you’ll love this version using almonds! I like to be a good mom. I like to be the cool mom. So I buy my kids Nutella. They love it. Nutella is one of those things you either like or you don’t. I don’t. And honestly, I never really thought about it. I’m not a big jelly eater either. Peanut Butter and Jelly sandwiches, I think I’ve had maybe one in my entire life. So the Nutella craze didn’t faze me in the least. I never even thought about why I didn’t like this chocolaty spread that everyone else just raves about. I just went on with life. 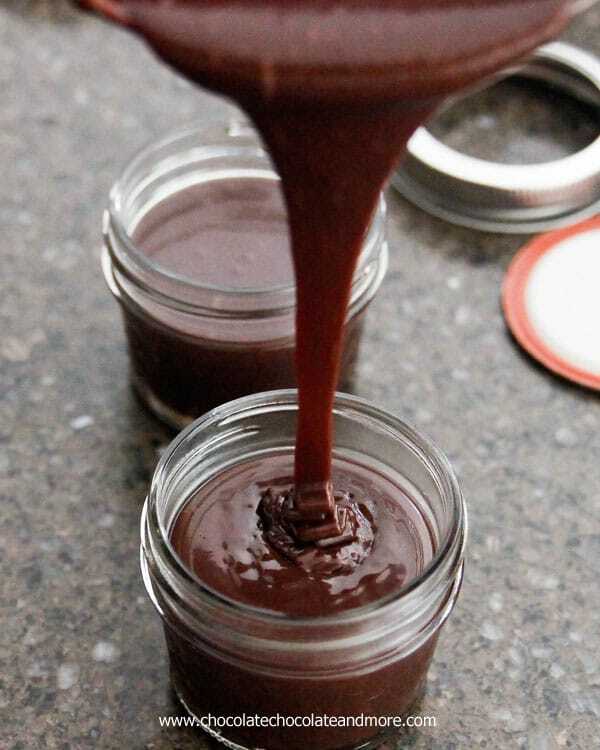 So I’m snooping around Silvia’s Cucina facebook page and I find this photo for Homemade Nutella. I share it on my page because that’s what I do, I share yummy photos with my friends. I don’t think anything more about it and go on about my business. At the grocery store, I’m restocking my baking pantry and I notice the slivered almonds. Hmmm, maybe I’ll try that recipe from Silvia’s. I pop the 5 ounce bag in my cart and finish with the rest of my shopping. I can now tell you why I don’t like Nutella. It’s the Hazelnuts! 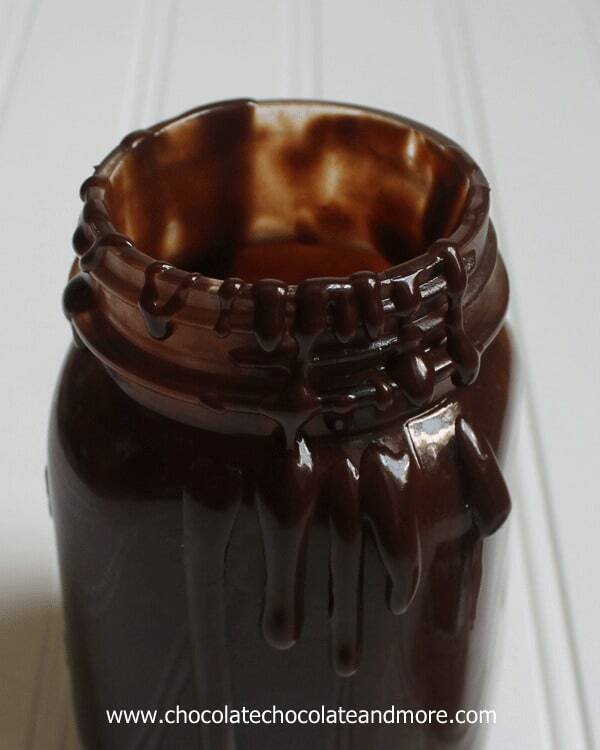 I am so in love with this Homemade “Nutella” I made 3 batches, using up all my almonds. I had to test out the cocoas, with and without the instant coffee. I wanted to be thorough for you. And maybe I wanted to keep licking spoons. 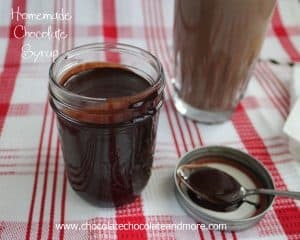 Making this takes no time at all and with Nutella running $5.00 and up a jar, I think we’ll be sticking with this homemade version from now on! 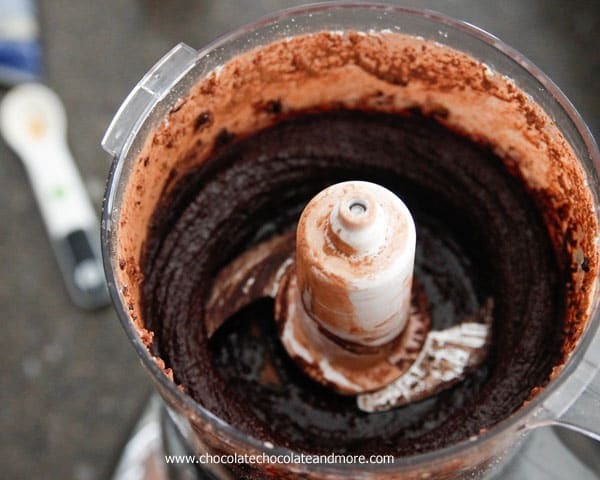 Once almonds are ground, add oil, cocoa, vanilla, brown sugar and coffee granules (if using) to your food processor. Blend for 20-30 seconds, to combine. In a small saucepan, over low heat combine paste with about 1/3 of the sweetened condensed milk. Stir until smooth then add another 1/3, stir again, then add remaining milk. Continue stirring until mixture is smooth and sugar is completely dissolved. Transfer to jars or other storage container. Once completely cool, store in refrigeratorfor up to 3 weeks. When using, if thick, just microwave for a few seconds to soften and make spreadable. After licking that spoon, and Yes I licked it! I had to try this out on something other than a slice of bread. Just 6 ingredients, a Food Precessor and a small sauce pan. 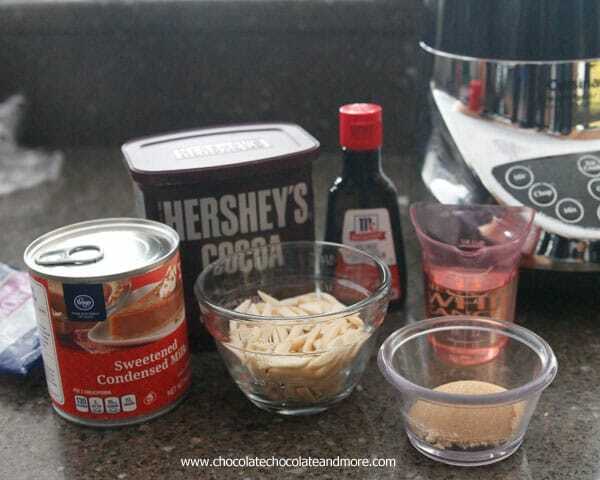 Process your almonds until a paste is formed, add the cocoa powder, oil, brown sugar and vanilla extract. Heat on stove over low heat, adding the sweetened condensed milk, until smooth. Then pour into jars. 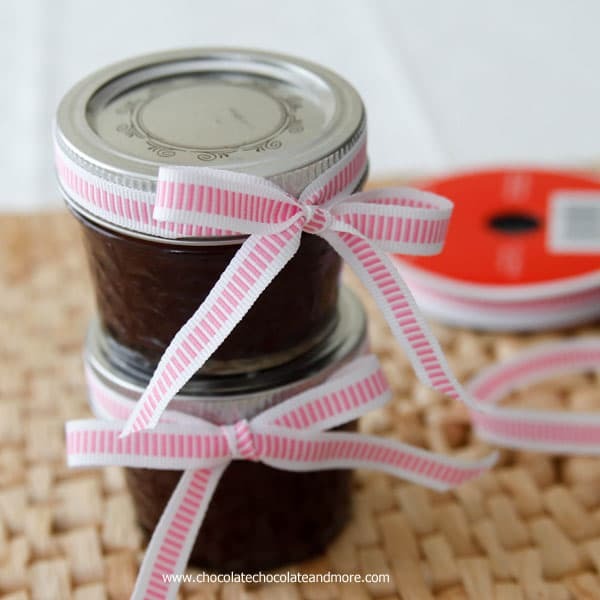 This also makes a nice gift, just add a little ribbon to the jars. By the spoon, on a slice of bread or toast, spread on crescent rolls and then baked as normal, this spread is good any way you choose to try it! I can’t wait to try out all those Nutella recipes with this stuff. Want more food in jars? I printed and I’m so making this! Carrie, I’ll bet the sunflower seed would be wonderful! let me know how it comes out! OMGosh! Great idea! I FINALLY just bought myself a food processor so I can totally make this! I was actually inspired to make something similar this weekend, take a look: http://jessica-healthymommyhealthybaby.blogspot.com/2012/08/meatless-monday-sugar-free-dairy-free.html. One more reason I really need a food processor! Looks amazing, Joan! Lesa, I don’t have a full size food processor, I have a Handy Dandy Chopper by Black and Decker that I’ve had for at least 10 years, it only holds about a cup and a half but worked perfect for this! How scrumptious, I really need to make my own Nutella! Oh. My. Goodness. Joan, I need this and a spoon and I’m done for. Done for, I tell you! How delish is that?! Oh, this looks so tasty! I haven’t made Nutella in several months. I do mine just a bit different by processing until the nuts have become a ‘butter’. That does away with the granules. And, being dairy free and unable to use the milk, it makes it much easier to have a spreadable blend. Thank you so much for sharing 🙂 I would like to invite you to share your recipe in our linky. It can be found here: http://allergiesandceliac.com/?p=258 Have a great week! Mary, thanks for sharing an alternative way to make this. I know lots of people have allergies and are always looking for ways to adapt their favorite recipes. Oh my gosh, Joan – I think I love you! How great is this?!? I’ll be getting supplies on my next shopping trip! How long will this store, and do we refrigerate or pantry? That’s a good question, all of the ingredients have a long shelf life but just personally I wouldn’t keep it more than a month and I’d keep it in the refrigerator. Oh how incredible!! Now I want some of this on top of some pound cake! I have whole almonds in the pantry. What is the total amount of almond grains used, or can I just use 1/3 cup of whole almonds? If your almonds are already ground, you’re looking for about 1/3 cup. I would probably use a heaping 1/2 cup of whole almonds to make up for the air space you’ll have between nuts. Thanks, cannot wait to make this! I wouldn’t recommend canning this, it would over cook the sweetened condensed milk and change it. Best to just keep in the fridge. in my house this stuff isn’t lasting long. I made 3 batches and I’ll have to make more next week. I like Nutella but I’ve never been crazy about it the way a lot of people are. It’s so rich! But I love the idea of making it from scratch! I love Nutella. I could probably eat a whole jar in one sitting if left to it!! 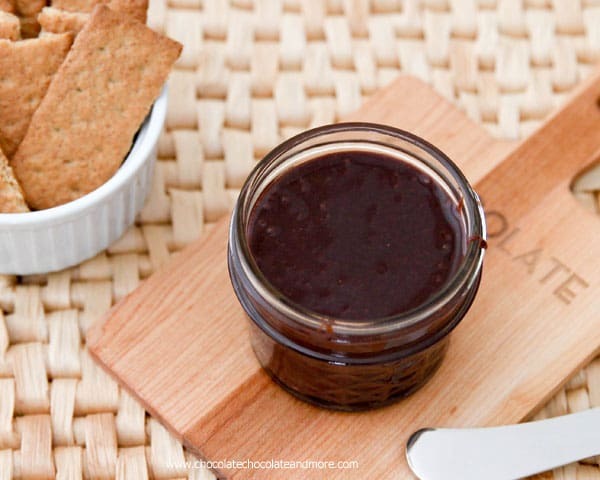 This homemade almond butter looks just as delicious. I will for sure be trying this out. Yes, they would, I was just using what I had in the cabinet! This looks great girl! LOVE IT. This would be very dangerous for me to have at my house! It is dangerous, I never touched the Nutella but I’ve been having a hard time staying away from this stuff! I love this idea so much! Nutella is not all that healthy dispite the advertizing that says so. This way you can add the oil and perhaps the nuts, of your choice and in my case, since I’m allergic to chocolate, I can use Carob. Love it, I’ll Pin it! Thanks for linking up with me! Nutella definitely isn’t healthy, I checked the jar and the very first ingredient for Nutella is sugar. I do like being able to control what goes in to my food at least. The Carob would be a great alternative! The sweetened condensed milk is not a healthy option. I’m wondering if I could use mashed banana or raw cream instead (or a combination of both). 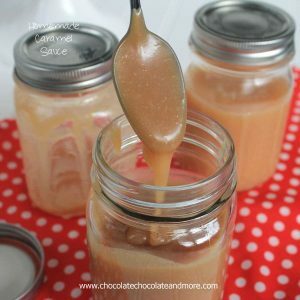 Katie’s recipe uses agave and milk instead of the sweetened condensed milk. I’d love to know if you try the banana, after all chocolate and bananas do go well together. This might just be the coolest thing I’ve ever seen. I love Nutella, but at the rate I eat it/use it in baking, I’m likely to go bankrupt. This is the answer to my Nutella prayers! With a 13 year old that adores Nutella, I will have to give this a try! It looks fabulous! Nutella or your version is awesome on fruit! We love to dip apples and strawberries. My kids like when I take a whole banana and slice it lengthwise, spread some Nutella on it then put it back together like a Sandwich! YUM YUM YUM!! We had some of this with apples and strawberries, also as a sandwich with peanut butter, spread on morning toast…we haven’t found a way not to eat this yet! Great idea about the banana, I’ll have to pick some up at the store and let the kids try it! What a great recipe, I can almost taste it, I will be making this soon. Hope you have a great holiday weekend and thank you so much for sharing with Full Plate Thursday. This recipe was so good!!! I didn’t have almonds so I used pumpkin seeds that I had gotten to make granola. It wasn’t as sweet as Nutella, but I don’t see that as a bad thing. I’ll have to see what my kids think of it when they get home from school. I love that you tried it with the pumpkin seeds, great alternative for anyone with nut allergies! Hope the kids enjoy it! I haven’t tried with anything but almonds yet, but I’ll give it a try with pecans (have them in the freezer) and let you know! Absolutely awesome- I needed this!!!! Can you believe I’ve never tried Nutella?! This looks great…I’m assuming it tastes even better than the store bought kind too!! I’m sharing this NOW on my FB page too!! I will be making this because like you I think Nutella is way too expensive! However, my girl loves it and often requests me to send it to her in college. Thank you for sharing on Foodie Friends Friday! Please come back and VOTE on Sunday! This is definitely worth a try! Looks fabulous. I prefer almonds to hazelnuts, though hazelnuts are ok. This could be dangerous!! I am excited to try this… Nutella? meh. But the almonds… now we’re talking! I am making this!!!! Thanks for linking up!!! You really had me interested when you said you didn’t eat pb and j!! Are you crazy?? 🙂 Thank heavens you like almonds because this looks heavenly!!! Wonderful post! Thanks for sharing at Foodtastic Friday! Although my husband really doesn’t like store bought nutella he might like this as I could put less chocolate in it. He has a peanut allergy so can’t eat peanut butter and we are always looking for alternatives. Thanks for sharing on Foodie Friends Friday and hoping come and join us again next week. Congradulations. I just came over from Back For Seconds. These look amazing. I have a link party on Wednesdays, and I would love it if you would link this and any other posts. It is called Wednesdays Adorned From Above Link Party. It runs from Wednesday to Sundays. I am totally going to try this! My kids are a little tired of our old standby peanut butter! Looks amazing!!!! Thanks so much for sharing at Mom On Timeout! With a hazelnut allergy in our family, Nutella hasn’t been allowed in our home for the past few years. I am going to try this one to see if it will work. YAY!! Just found your blog today. We all love nutella around here but your version sounds so tasty. I pinned this for later use when I decide to make some. Thanks for the recipe! i want to know which vegetable oil should be used & does the smell of oil comes in the final product?? Hi Momina, I’ve used Wesson, Crisco and even generic oil, also canola oil so far. I haven’t noticed any smell other than chocolate coming from this. The original recipe used grape seed oil and I’ve also seen versions using olive oil. Let me know if you try it and what oil you decide to use. sure will tell u about my result…..can i use corn oil instead of canola oil?? Oh my GOSH!! This looks truly AMAZING! I think I would have to give it away, so that I wouldn’t eat all of it! Oh my goodness. I love your recipe. The pumpkin spice white hot chocolate is sooooo good!! I love Nutella so much thanks so much for this! Your blog is the best I have ever stumbled upon. Sarah, you are so sweet! I’m actually having a White Hot Chocolate as I type this, it’s become a nighttime ritual for me. So glad you’re enjoying what I have to share, hugs! Can I get on your Christmas list? YUM!!!!!! i am from trinidad ,nutella is about 30 dollar a bottle so making a homemade version is great ,i just love your blog thanks! Just wondering: could I use almond flour in this? I have so much left over from trying to make macarons! BTW, Love your site, so glad I found you on Pinterest! You probably could, you grind the almonds down to almost flour anyway, try it and let me know! If I wanted to use Almond Meal, how much would I use? Do you know the weight of a 1/3 cup slivered almonds? Hi Bob, it’d be about 1 ounce. Enjoy! 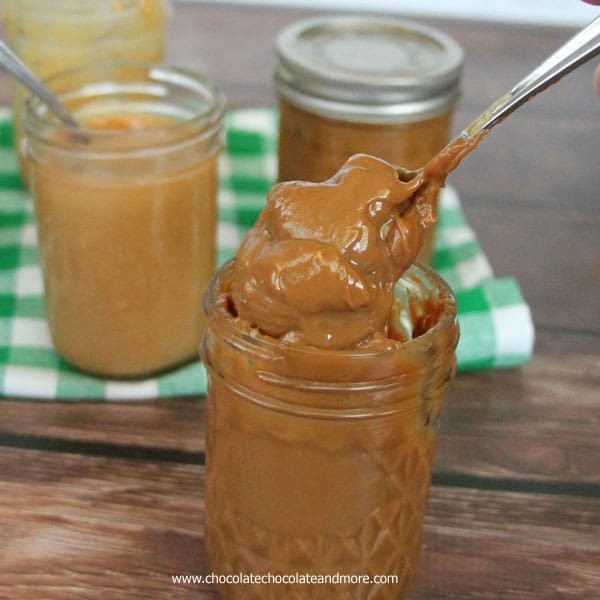 Perusing my Facebook feed and see this…will be making later today since I’ve been meaning to make almond butter anyway! LOVE! Hi. I’m not a huge Nutella fan, but I really like the idea with almonds. I was wondering, however, if you an taste ANY of the coffee flavor in this. Coffee is in my top ten “dislikes” (it’s amazing how we’re all so different…. my hubbie can’t function without his coffee). I want to try this and get the fullest flavor, but I don’t want to taste any coffee. Thanks so much for all the wonderful recipes you post. I’ve never tried Nutella because I HATE hazelnuts. (In Europe, the nuts in candy are almost invariably hazelnuts.) I’m really looking forward to making this with almonds. I also can’t stand the taste of coffee or anything mocha flavored, so I’ll be leaving out the coffee, I don’t care HOW much it’s supposed to help the flavor. I can’t even eat the mocha-flavored frosting on a yule-log. Hey Joan!! I tried making this but mine turned out to be very sticky once it’s cold. Have I gone wrong somewhere? I used finely ground almonds and processed the mixture for more than 3 Mins as I didn’t think it was forming into a paste, becoz wet ingredient was only oil n vanilla essence. Pls help shall appreciate! Were your almonds raw? This will be a sticky spread but should spread easily. I would recommend adding a bit more oil is you want a thinner spread. I think if you serve it with graham crackers it is considered a healthy snack!!! YUM, can’t wait to make it–thank U thank U!!! Just pass me the largest spoon you’ve got! Wow! Lovely recipe! My kids love nutella and this will be better! In Italy, we used to make our own ‘nutella’ from fresh hazelnuts, good quality chocolate and NO questionable ADDITIVES. That’s the secret to making a version of nutella that you’ll love. Do you know how much nutella we go thru in this household? Or, well, at least the aldi brand. Jars. and jar. I printed off your recipe, pinned it to my pinterest account and will get the ingredients next time I’m at the grocery store. Thank you!